In what was possibly the most perfect gift for me, I was given a Michael Kors Nail Lacquer gift set, complete with Runway Star, Rock Star and Superstar – three glam shimmery shades. I immediately fell in love with the colors and the opacity of the polishes. I had to create a rock star manicure to go with these rock star shades – so what did I create? Read on to learn how I got this Gradient Graffiti look! I started this manicure as I start all manicures – with clean nails and a coat of Nail Tek II. A base coat is especially important for glitter manicures, as glitter polishes tend to be more difficult to take off, which requires more nail polish remover potentially stripping your nails. The Michael Kors Nail Lacquers were pretty opaque, so only one coat was needed – but I went ahead and used two out of habit. I started with two coats of Rock Star, a deep blend of olive, black, and shimmery gray. I can’t even begin to explain it, but it’s a beautiful color. 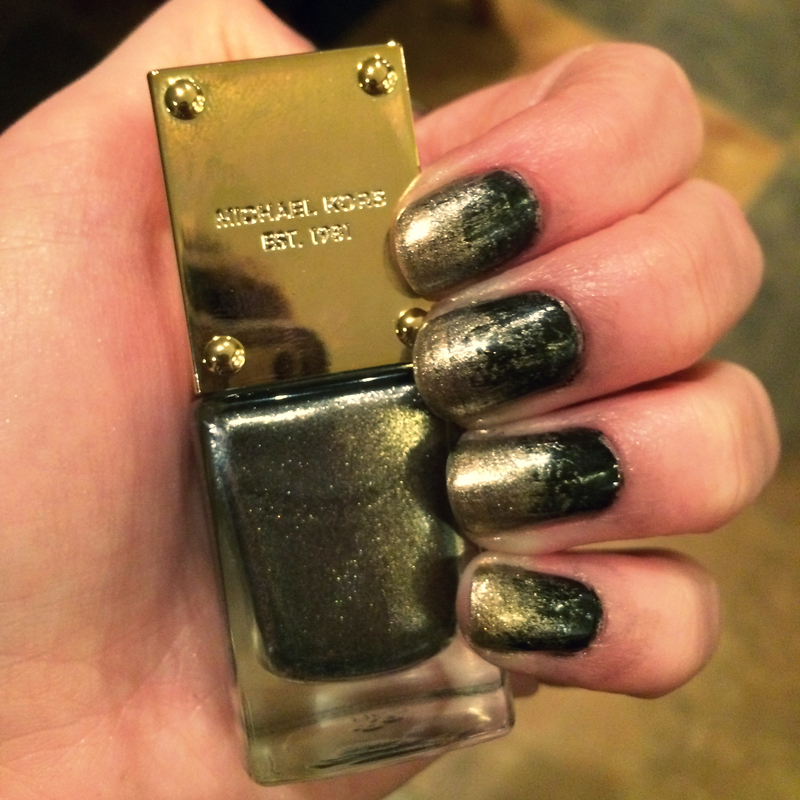 My goal for this manicure was to create a gradient of just Rock Star and Runway Star, a bright, shining gold. As I began applying Runway Star to the tips of each nail, I realized it wasn’t turning out exactly as I expected. Runway Star was just making it look like there was a little extra glitter deposited at the tips of my nails – so I had to think outside the box. Flashback to my middle school ceramics classes and I remembered dry brushing – a technique where you wipe most of the paint off of your brush and continue to paint, leaving only a little bit left on your nail. I used a regular black polish and dry brushed from the beds of my nails down towards the center. It created this beautiful graffiti gradient effect – perfect to really make the shimmer in the Michael Kors Nail Lacquers stand out. So how can you get this look? You don’t need Michael Kors Nail Lacquers specifically – grab a few of your favorite glitters and a plain black polish, and you’re good to go! Share with us on Twitter @Collaboreight – what are you rocking for #ManicureMonday? This look reminds me of the spray can artists on the streets of Manhattan. Super cool look!